Frances is the Team Leader for Providers for Healthy Living's Gahanna office. Frances is a licensed independent social worker trained to diagnose and treat mental and emotional disorders. Frances earned her master’s degree in social work from The Ohio State University. Frances has over 20 years experience in the mental health field in both clinical and supervisory capacities. Before joining Providers For Healthy Living, Frances worked in the juvenile justice system, and in community mental health. Frances teaches at Mount Vernon Nazarene College in the Adult Degree Completion Social Work program and has also taught in the Social Work program at The Ohio State University. 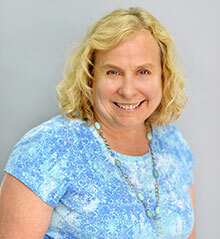 ​Frances provides individual and family therapy to children, adolescents and adults, with a special focus on CBT, Structural Family Therapy, and Motivational Interviewing with dual diagnosis clients. Frances has completed Level 1 Training in Gottman Method Couples Therapy and uses Gottman Method Couples Therapy in her work.